January 4, 2018, 2:38 PM · Welcome to "For the Record," Violinist.com's weekly roundup of new releases of recordings by violinists, violists, cellists and other classical musicians. We hope it helps you keep track of your favorite artists, as well as find some new ones to add to your listening! Rachel Barton Pine. Image by Lisa-Marie Mazzucco. 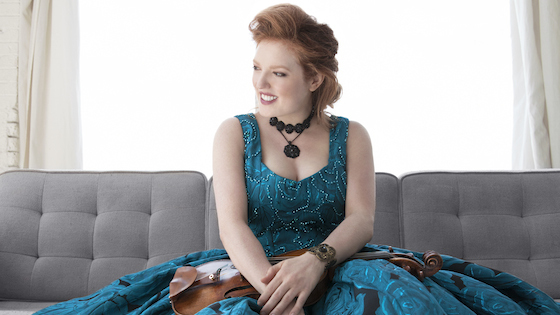 Chicago-based violinist Rachel Barton Pine's newest album features the well-known Violin Concerto No. 1 by Max Bruch, as well as Violin Concerto in B minor by Edward Elgar, written 44 years later. It is is dedicated to "the memory of a musical hero and generous friend, Sir Neville Marriner," with whom she was originally to recorded the album. Pine worked with Marriner on the scores before his death in 2016, and Marriner related to her accounts of his teacher, violinist Billy Reed. Reed was the former leader of the London Symphony Orchestra, who collaborated with Elgar on the creation of the violin concerto. The concerto was commissioned Fritz Kreisler, who premiered it in 1910. For the recording, conductor Andrew Litton conducts the BBC Symphony Orchestra. While the Bruch Concerto was the first major Romantic concerto that Pine learned, the Elgar was among the last. When learning it early in her professional career, "I counted 89 highly technical spots that I had to isolate and practice separately over and over," Pine writes in the program notes. "I also can't think of any other violin concerto with Elgar's density of tempo alterations. To make sure I didn't miss them, I marked them all with a yellow highlighter, making my music look quite colorful." BELOW: Pine talks about her new album, including a description of her conversations with Marriner. Toke Møldrup's virtuosic new set of Bach's six cello suites was recorded on a 1697 David Tecchler cello and culminates with a wildly decorated 6th suite performed on a five-stringed Italian instrument. Møldrup is principal cellist of the Copenhagen Philharmonic Orchestra, and professor of cello at the Royal Danish Academy of Music. The two-disc set also includes Viggo Mangor's charming arrangement of Suite no. 1 for two violins, organ and cello. "After a long musical ride with the 367-years-old but forever-present master of music, J.S. Bach, my recording of his cello suites including a chamber music 'reconstruction' of his first suite is out now!" writes Møldrup on his website. BELOW: Cellist Toke Møldrup performs an excerpt from Suite for Cello in D major, BWV 1012 by J.S. Bach. The new year marks the centennial of the death of French composer Claude Debussy (1862-1918). For fans of this pioneering musical Impressionist, here is a 33-CD set comprising all Debussy's known works, including four pieces in world premiere recordings made especially for this edition, curated with the help of Debussy expert Denis Herlin. The recordings span more than a century, including recordings made by Debussy himself, at the piano. Other performers include: Martha Argerich, Itzhak Perlman, Yehudi Menuhin, Daniel Barenboim, Natalie Dessay, Sir Simon Rattle, Aldo Ciccolini, Philippe Jaroussky, Gérard Souzay, Pierre-Laurent Aimard, Kent Nagano, Quatuor Ebene, Samson François, Roberto Alagna and more. BELOW: A teaser for the CD set.